got my first entry for the challenge over the weekend from our perhapa-pal warren newsom and let me just say--this is going to be GOOD! if any of the other entries are even a fraction of the smack that warren laid down, this is going to be a fun and fantastic ride! hope you're all working hard on your covers--and having fun, of course! 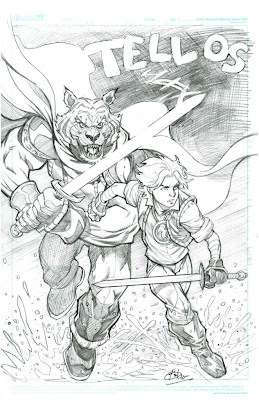 and on the subject of art, as artist eric henson continues to stun me with each new page of the perhapanauts back-up story that he and i are working on, he hooked me up with this beautiful tellos piece by his friend, bat hilliard. this was a commission and so we wanted to be sure that it was okay to post...uh, and it was. so here it is. it's always wonderful to see any of our tellos gang again--and a little bittersweet. hopefully, i'll be able to give you some new tellos news in the not-too-distant future. Really excited to see how the challenge turns out! I bet there will be some stellar entries. I haven't thrown in my hat in, but thats just because I want to dedicate all my art-time to the project. Still excited to see the outcome of this challenge though! And that Tellos sketch from Bat is still very cool looking! Glad you posted it! Great Tellos sketch and even better is the prospect of some Tellos news in the not too distant future. That's one solid Tellos piece! Lovely! That is a very nice piece of work. thanks todd and eric! i appreciate the kind words. Really miss Ringo but his legend and inspiration continues on. btw, my dad is driving a convoy truck over in iraq and while stationed at one of the bases he ran across a perhapanaught's comic in the commissary recently! pretty cool, huh? The product its self sounds great and quite intuitive which I feel is vital for photo bases applications. Look forward to checking it out myself – especially if i win!